Previous Article,Here is An Another Article Related to it,Which Is known As Aero Snap. What is Aero Snap ??? Side. We Can Use it For Making Or noting What Happens in Other Windows. See the Below Screen Shot for More Details. How to Turn On it ?? Step 1 : Logon to Your Windows PC. 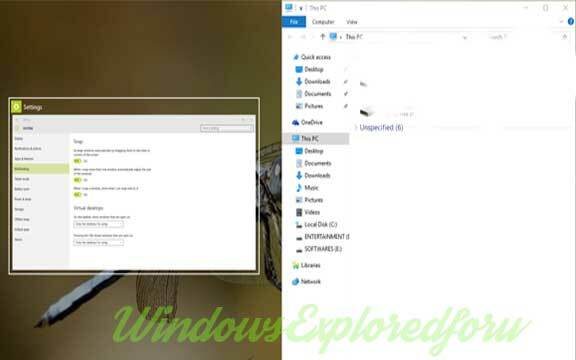 Step 4 : A New Window Will open Click on Multitasking Which Will be on Left Pane. Step 6 : Slide it Towards Right Side to Turn It ON. Similarly Slide Towards Left side for Turn OFF. Note : If the Option is Already On then don't do Anything,Just Skip it to Step 7. Step 7 : Close the Window. That's All You Have Successfully Turn On the Aero snap. 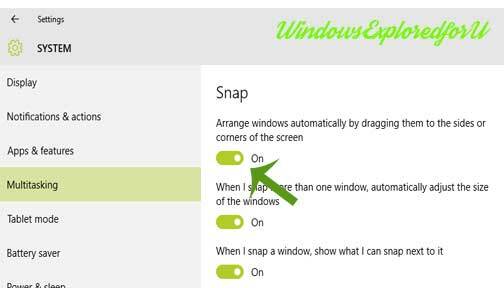 You Can Use the Following Shortcut Keys For Making Windows Snap. Windows + Left Arrow -> Make's the Window to Move Left Side. Windows + Right Arrow -> Moves the Window to Move right Side. Windows + Up Arrow -> Moves to Upside. Windows + down Arrow -> Moves the Window to Right Side.